Training - Endeavour Drilling Ltd Training. Conferences, Courses and Seminars covering Business, Health and Safety, CDM regulations and various other topics. Cable Percussive Rigs – Standard and cut down (stainless steel casing available at 200mm and 150mm for UXO sites). Standard casing available up to 300mm. Dando Terrier Rigs – track mounted – SPT’s, liner sampling, DPH and DPSH. Restricted access modular Archway Dart rig. Window Sampling – hydraulic/electric/fuel hammer with hydraulic or manual jacks. Comacchio Geo205 Tracked Rotary Rig – Percussive liner sampling, augering (hollow and CFA), rotary open holing and coring. Comacchio MC 305 tracked rotary Rig – Hollow (up to 300mm) and CFA. Wirth HD10S limited access rotary rig. Concrete Coring/Diamond Drilling – Hydraulic and electric. In-situ CBR’s from 4x4 or JCB. TRL Dynamic Cone Penetrometer and Mackintosh Probing. Hand dig pitting teams – Foundation inspection and service clearance. Inclinometer, gas and groundwater monitoring. Our latest innovation is a modular dynamic sampling rig (based on an Archway Dart) specifically modified to cater for rail embankment sites but suitable for any site where access is a particular issue. The rig arrives on site in a 4x4 and takes approximately 25 minutes to build once the parts are at the drilling location. 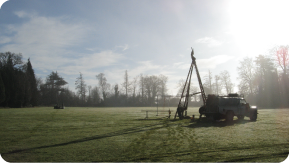 Endeavour Drilling have reliable relationships with UKAS, NAMAS and MCERTS accredited geotechnical and environmental laboratories. Sample collections are often free or at a very reasonable rate.